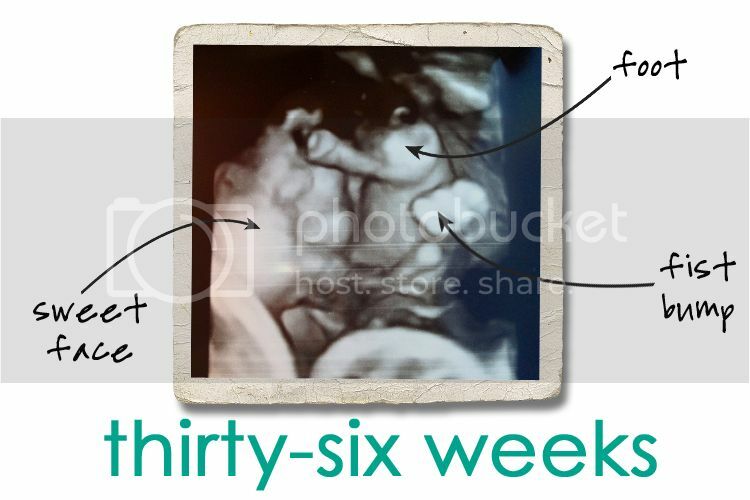 Jordy Liz Blogs: Thirty-six weeks. We saw your sweet face this week for the last time until we meet you in person. You were definitely more squished than the last time we saw you at just eighteen weeks. We captured this picture of your face up against your leg and arm. Hopefully we'll meet you soon so you can have a little more room to stretch. They took measurements of you to make sure you were on track, since you've been measuring so much bigger at my appointments. Based on the measurements, you're just a few days a head of schedule. You currently weigh 6 pounds 9 ounces and are in the 67th percentile of babies at this age. I was 6 pounds 14 ounces when I was born, so you'll definitely beat me out. I also had my weekly appointment this week. I am still one to two centimeters dilated, but you've moved down even lower than last week (and I can definitely tell). After the doctor checked everything out, she looked at me, raised her eyebrows and said, "I think we'll be seeing this baby before 38 weeks." It all of a sudden hit me and became very much real. We are so ready for you, but the list of things to do in my head is now much more urgent. Sleep has become next to impossible as of this week. I wake up every few hours and have to shift positions, and then it takes forever to fall back asleep. I'll just chalk it up to getting ready for waking up every few hours with you soon enough. We are getting anxious to meet you, Baby. I'm getting so excited for you!! Can't wait until he/she arrives! Wow!! You are getting so close. Hope you are feeling well, aside from the sleepless nights.